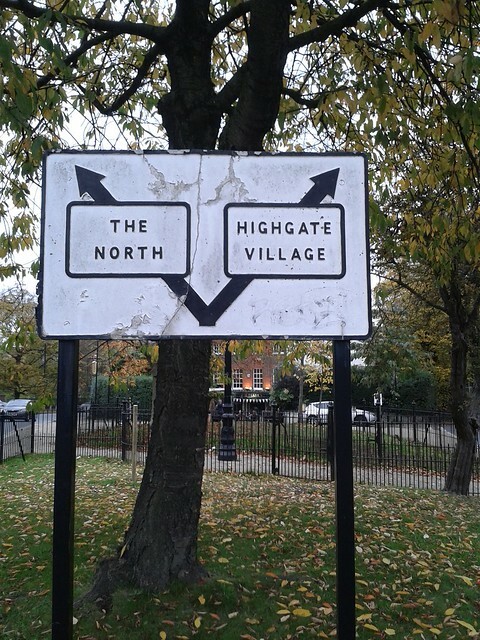 Rambling reflections on the year, some favourite micro-moments and daydreams and new habits. A resolution for 2017 was to tilt the balance of my creativity from consuming to creating, and I enjoyed the feeling of being far more active rather than passive in this regard, all year long. This manifested in some really fun projects: we now have a delightful shelf full of homemade jams and chutneys (including Hampstead Heath blackberry jam, picked by hand one summer afternoon); I worked on a really cool ethnography project at work; made some fun crafts; did some analog data visualization; published a quarterly writing series; cooked lots of good food; and started doing a bunch of volunteering, including an invigorating time ripping out brambles at a favourite park, some footfall data collection & analysis at that same park (the perfect volunteering gig because it combined morning runs with data stuff), and some writing on medical research for a public health NGO. I also added some new regimes to my daily running practice, tackling a push-up challenge for a while, and pumping iron at the gym most weekends (feels GREAT). Some other neat moments in my list for the year. I hurried home to watch the live coverage of the solar eclipse on TV (magic! nerdy glee!). Ditto the Cassini Saturn explorer coverage. I loved exploring new places, including new parts of Hong Kong, and new cities like Milan and Warsaw. We adopted a few new travel habits that helped things to evolve in a nice way, e.g., staying in one place instead of moving around every few days, finding a local gym with a tourist week pass to keep the healthy self-image going. I kind of lost my reading mojo at the beginning of the year and didn't really enjoy any of the books that I picked up during this time (this also coincided with my shift to making lots of stuff, so I had other endeavours to keep me busy in the meantime), but I got back into reading with a stack of books in the summer. I still think about the stories in many of these favourite books (particularly H is for Hawk, which then also had a documentary follow-up on BBC later in the year, lovely and amazing). Saw some fantastic museum exhibits that continue to create sparkles in my mind, including the cabinets of curiosities at the Pitt Rivers Museum in Oxford, the birds eggs and nests at Artangel, the hidden street art in the alleys of Kwun Tong, and the history, folklore and artefacts at the Franklin Arctic exhibit. To wrap up my rambles, a few quotes that I had collected in this draft and that I share here now because they resonated me at various times this year. I kept this first one because I'm still trying to figure out the dynamics of "Englishness" that I encounter day-to-day, particularly at work. I kept this one because I like the philosophy of curiosity, of seeing new places, of challenging yourself, of not getting into a rut of same-old-same-old. And I kept this one because I love the "we must carry on" philosophy. 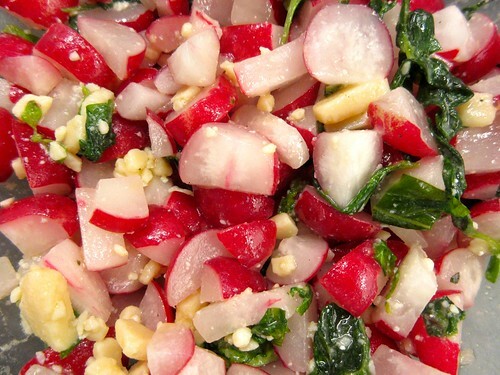 Radish Salad - I got the April Bloomfield cookbook for Christmas, and made this refreshing salad for New Year's Eve dinner. 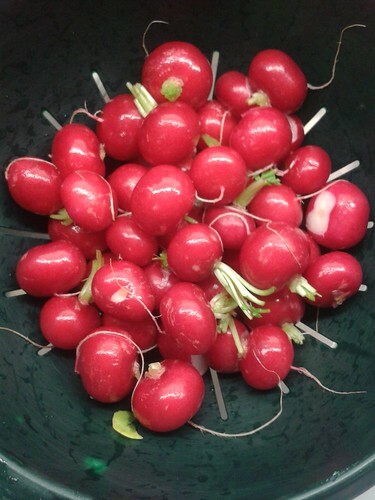 Combining radish, basil, lemon juice, olive oil, Maldon salt and Parmesan cheese, and follow her instruction to smoosh it all together with your bare hands, it's fun and really melds the flavours together nicely. Carrot Salad with Feta and Mint - A total staple from last year, healthy and fresh (and easy). Shred a pile of carrots, add chopped mint and crumbled feta, followed by a dressing made of harissa, olive oil and lots of fresh lemon juice. Lentil and Chickpea Salad - A repeat from last year, this is SO delicious. Tahini dressing, sweet lemon juice, toasted spices and sesame seeds. If you leave it overnight, the red onion (which I chop into fine pieces, instead of slivers) mellows from sharp into sweetness. So good that I stopped at the greengrocer to get sage at the crack of dawn after my run so that I could make this. Warm Butternut Squash and Chickpea Salad - One from last year's list of faves, chopped red onion, chickpeas and roasted chunks of butternut squash, all coated in a lemony tahini dressing. Fantastic as a dinner, fantastic the next few days for lunch too. 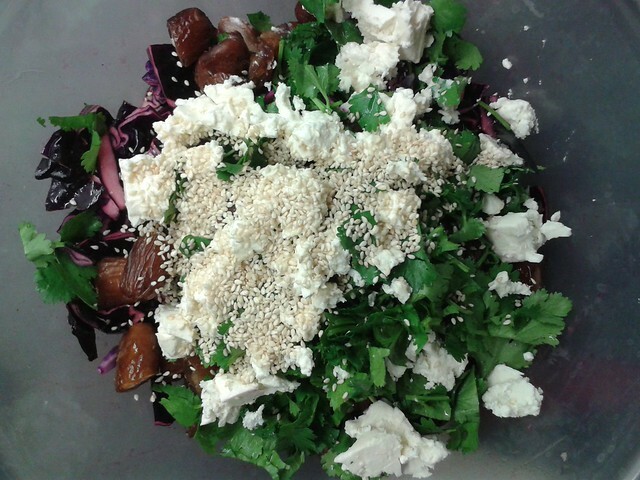 Red Cabbage Salad with Dates and Feta - Crunchy, sweet, salty, delicious salad, excellent for lunches. Nice lime juice dressing. Lots of cilantro and toasted sesame seeds. Stays nice and crunchy for days, so I make a big batch and then we have it as a side all week. Red Cabbage Salad with Spinach and Peanuts - Also delicious, primarily because of the peanuts and the cumin-laced dressing. But a bit of cabbage overload as I made this in the same week as the other red cabbage salad. 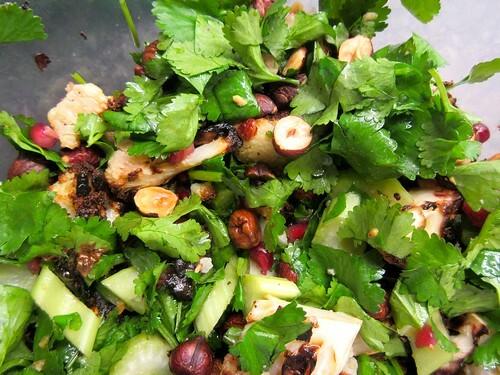 Roasted Cauliflower & Hazelnut Salad - I had made this a few years ago and hadn't remembered how delicious it was to have the roasted cauliflower (the flavour is really amazing), roasted hazelnuts, fresh herbs, celery and pomegranate all mixed together. Fantastic. Excellent for work lunches, the envy of the office. Tabbouleh - Classic, loaded with fresh greens and juicy cherry tomatoes. Pesto potato salad with green beans - Repeat favourite, always fresh and tasty, and super easy. Lots of greens and the pesto flavour is fantastic. Salmon and Chickpea Salad - Another repeat favourite, excellent for a summery evening. Potatoes with Soft Eggs and Bacon Vinaigrette - A delicious, fancy summer salad. 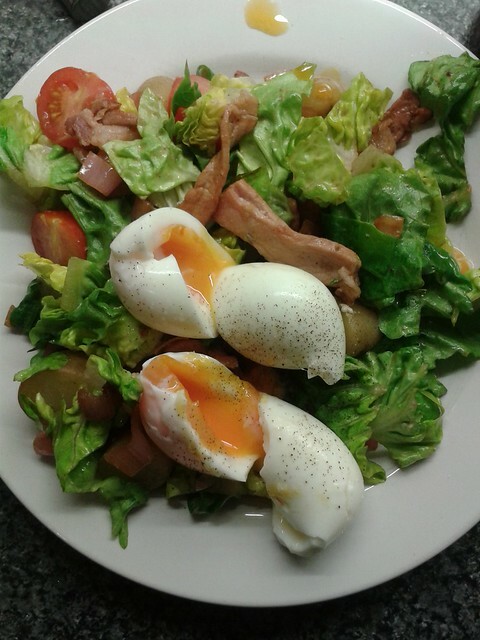 Bacon and a little Stilton from our butcher, veggies and eggs from our greengrocer. 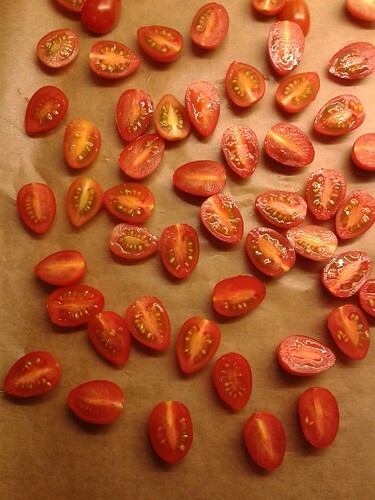 I also added some beautiful candy-like sweet cherry tomatoes. Went back for seconds. Potato Leek Soup - I bought a massive amount of leeks from the green grocer, and it made me the talk to the town. Each subsequent shop at which I stopped on my morning errands had someone asking what I was going to do with the big sack of green stalks. Spinach leek potatoes in one case, and this easy peasy potato leek soup in another. 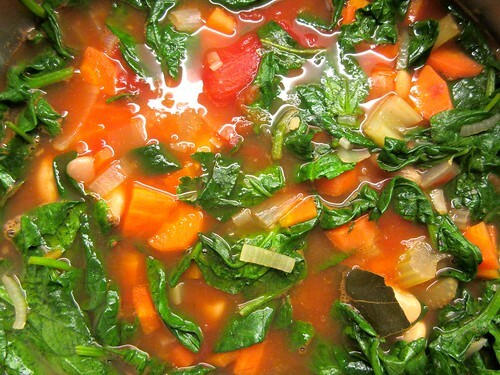 White Bean Stew - A classic old favourite, tons of veggies (carrots, celery, tomatoes, shallots, spinach) in a rich broth with white beans. Served with a toasted ciabatta roll to dip in the broth. Chicken Noodle Soup - Tons of veggies, used real chicken stock, chunks of chicken breast. Excellent. Beef Barley Soup - autumn, big pots of soup, this one has shortribs from the butcher and starts off as a massive pot solid with veggies from Greens. Simmers for about 3 - 4 hours. 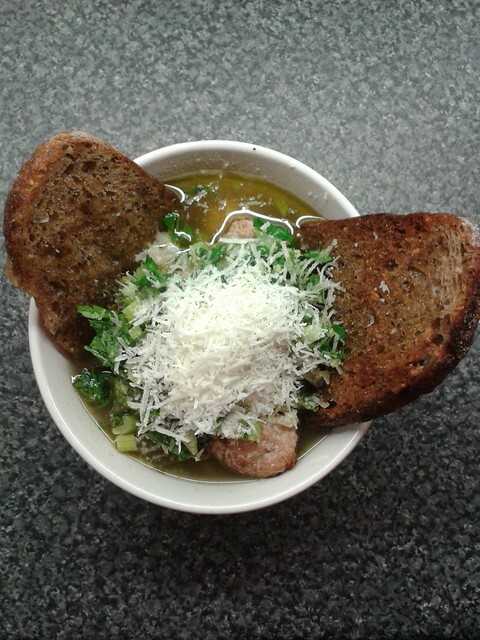 Sausage + Kale Soup - This appeared in a Bon Appetit recipe, and it is delicious. Get 500g sausage from the Highgate Butcher, brown it in a big pot. Once it's all brown and crispy, take the meat out and put chopped onions + celery in the pan. Soften and brown that lot, then add cannelini beans (instead of the black eyed peas) and the sausage, a few litres of water, bring to a boil. Then add a Parmesan cheese rind, and simmer for 45 minutes. Serve with olive oil toast, salsa verde and a cloud of Parmesan. Fish Stew - Devon, fishmonger had halibut filet and shrimp and a lovely tomato broth, so we cooked it all up in the little apartment for a holiday meal with bread and a glass of red wine. Pasta e Fagioli Soup - Tomato soup with kidney beans and macaroni, very hearty, a bowl of Italian yumminess. Lamb Chops with Chimichurri - Another April Bloomfield, the green herb sauce full of parsley and mint was lovely with the lamb chops, which came all specially cut from our favourite local butcher. Masala Lamb Chops - Came across Patel Brothers, a shop full of spices and goodness on a walk along Tooting Broadway, so I stocked up on chaat masala and did a repeat of this delicious lamb chop dish from last year. RAVE reviews from James. One minor substitute, I used crushed hazelnuts instead of pistachios, because that's what I had in the pantry. Spinach Leek Potatoes - Bake potatoes until soft, scoop out the centres, mash with wilted spinach & sliced cooked leeks, cheddar, no fat Greek yogurt, some Parmesan cheese, salt & pepper. Spoon the mash back into the potato skin shells and bake for another half hour. Yum. Leek Meatballs - Ottolenghi classic, delicious and lemony. Sausage with Greens - Classic from years past, perfect combo of green herbs, sugar snaps, etc. and excellent sausage from our butcher. Peppers Stuffed with Corn Risotto - Yum. Made a batch of six of these so that I could take a bunch for lunch during the week. Chorizo Bean Bowl - Healthy, favourite staple for weeknights. Doesn't even need the rice. Works with lots of variation. Cottage Pie - Did you know that a Shepherd's Pie should have mince lamb, while a Cottage Pie is mince beef? Now I know too! We made one on a cold January evening, and it was delicious. Secret James-genius moment, add two tablespoons of Dijon mustard to the mashed potatoes, excellent. Pizza - Made this on a cold January day and sat the bowl of dough next to the radiator to help it rise (worked!). I used wholemeal bread flour, the stuff we had used to make parathas one time, and it was delicious. The best tomatoes and basil from our green grocer and some fresh mozzarella. Le yum. Highgate Stew - I call it Highgate Stew because we got beautiful meat from the local butcher, and beautiful carrots, onions and mushrooms (and thyme + parsley) from the greengrocer, and it all came together in one gorgeously fragrant simmering pot of tenderness. Sunday dinner and lots of lunches and weeknight dinners to follow. Green Beans with Hazelnuts and Mustard Dressing - We went for our 2016 anniversary dinner to a beautiful restaurant in Islington, and one of the side dishes was a warm batch of long green beans topped with a mustard sauce and crunchy toasted hazelnuts. So I did my best to replicate this shortly thereafter, for our New Year's Eve feast. Yum. Spinach Torta - Just made the filling (no potato crust), mixing ricotta, feta, chives, coriander, wilted spinach with two eggs and the zest of a lemon, and baking it in a pie dish for 40 minute. Savoury green goodness. Chana Masala - Fabulous vegetarian dish full of flavour, so tangy and delicious over some jasmine rice. 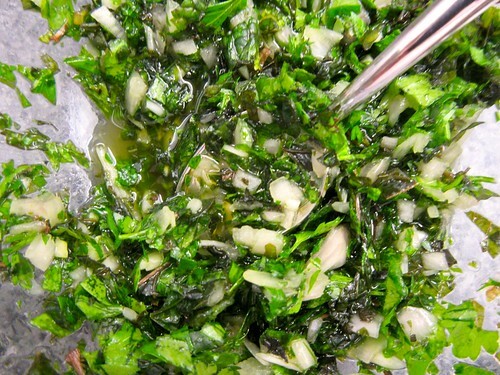 Give it a good squeeze of fresh lemon juice and a sprinkle of cilantro. South Indian Dahl - Red lentils cooked with tomatoes, red onions, various spices and coconut milk, garnished with cilantro, lime wedges and toasted coconuts. Jenn's Indian Kitchen, super delicious. 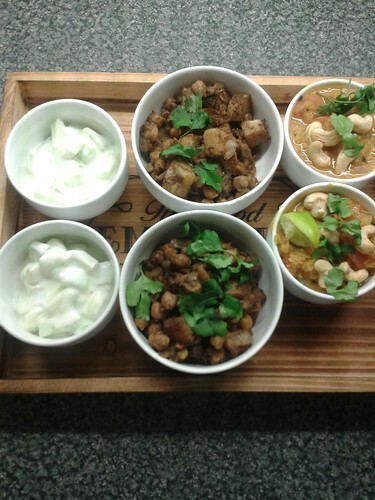 Indian thalis dinner: South Indian Dahl, aloo chana chaat, cucumber yogurt sauce. Beef Chili - For the first time I used chili powder, acquired from Taj Stores on Brick Lane, and WOOOHOOOO that is SPICY. This is a favourite recipe of mine, sans the chili. Steak Au Poivre - We had steak! From the local butcher! Two lovely sirloins, following this recipe, just without the creme fraiche part (and we cooked them in the sauce a bit longer to bring them to medium rather than rare). Amazing with some side salads. Pasta Salad With Roasted Tomatoes - Amazing, but should have taken the tomatoes out after 45 minutes because at 90, they were crispy. Nevertheless, delicious! Black olives, basil, toasted pine nuts, feta and the tomatoes, which we mixed with whole wheat pasta twirlies. Didn't use garlic in the dressing, didn't miss it - - oregano, olive oil, vinegar, lemon juice, salt and pepper in the dressing, all fantastic. Roast Beef Braised With Tomatoes and Garlic - In the oven for four hours, a good Sunday meal. Amazing thanks to our butcher. Also tried with short ribs (and no garlic). Cacio e Pepe - A chunk of leftover Parmesan inspired this late night meal, super amazing, went back for seconds. Pizza Pockets - Used Smitten Kitchen's overnight pizza dough recipe and filled these with halved cherry tomatoes, red pepper bites, mozzarella, grated Parmesan cheese and basil. Fun and yum. Roast Chicken - Our butcher has fantastic whole chickens. Roast one with lemon and lots of veg, and a week of soup stock, wraps, and delicious meals to follow. Pea Crostini - Fresh, green, good on toasts. Added mint to the mash. Fishcakes - Mash sardines, potato, capers, spring onions, shape into patties and fry up. Absolutely delicious, and they held their patty shape nicely! Good with corn on the cob. Cold Rice Noodles with Fresh Herbs and Crunchy Veg, and Lime Marinated Chicken - didn't use the peanut sauce in this recipe, but made a nice rice vinegar, soya sauce, ginger, sesame oil and lime juice marinade/dressing. Crab Pasta with Peas - Dartmouth, we got fresh Devon crab from the fishmonger and fresh tagliatelle from the fancy deli, and cooked it up with lemon juice, lemon zest and snap peas. Fresh and delicious. Onion Tart - Autumn cooking. Big pot of caramelized onions with beef stock simmered in (and a little brandy), topped with some Comté from Borough Market, baked into crisp bubbly deliciousness. Excellent when reheated a few days later. Swiss Chard Gratin - I love this side dish because it's not cheesy, it's just fresh bright rainbow chard, wilted with onion, some milk, flour & butter to thicken, and topped with bread crumbs. Very delicious and easy. Pork Chops with Apple and Sage - This recipe was okay. Not the flavour punch that I was hoping for, but not bad. Mushroom and Spinach Frittata - Fry up some sliced mushrooms, wilt in some spinach, fold into 8 whisked eggs with a bit of milk, salt, pepper, and crumbled Stilton (also added spring onions), and bake for 40 minutes. Slices for lunch, excellent. Merguez Sausages with Herby Yogurt - Sausages from the butcher, lovely, served with a side of the yogurt with cucumber and parsley (use mint next time). Yum! Shake Shack Burgers - Incredible! Spectacular! Aside from the soft rolls and the Shack Sauce, the key trick appears to be forming the meat into cylinders, putting these in the freezer, and then cooking in the hot pan by quickly flattening them. OMG, these were fantastic. So good that I can't make them too often, because I'd wolf them down all the time. Fish Sticks - Easy, yummy. Good cod from the Archway fishmonger. Tomato salsa on the side. Lamb and Lentil Lettuce Wraps with Salsa - Really delicious and refreshing, especially done "lettuce wrap"-style with the cucumber, onion and tomato salsa. And the tahini lemon yogurt sauce. Our butcher didn't have mince lamb, so we used lamb sausages, roasted until crisp and then mixed with brown lentils that had been simmered until soft with a dash of ground coriander and cumin for flavour. Yum. Roast Pork Asian Salad Rolls - Roasted pork tenderloin marinaded in a hoisin, soya sauce, ginger sauce, with which the meat was basted during the roast. Made wraps with basil, mint, spring onions, coriander, cucumber, green beans, mango and a squirt of lime juice. Peanut Butter Chocolate Chip Cookies - Hiking snacks. These were delicious! I just smashed up a bar of dark chocolate, didn't bother with hunting down peanut butter chips. 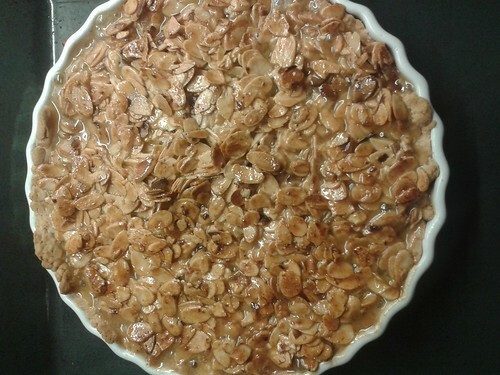 Almond Tart - We saw this on a Rick Stein cooking show, and James said, "that looks amazing." So on a cold January afternoon, we had a big cook and made the pie crust and filling for this tart of amazingness. All toasted almond and caramel goodness. Rhubarb Crumble - When we spotted rhubarb at our favourite local greengrocer, that beautiful variegation of pale green to deep pink, we were eager to get some for a nice dessert. This is lovely, tangy and bright. James loves his with some custard. I read so many excellent books in 2017, the ones shown here were my most favourite out of all of them. 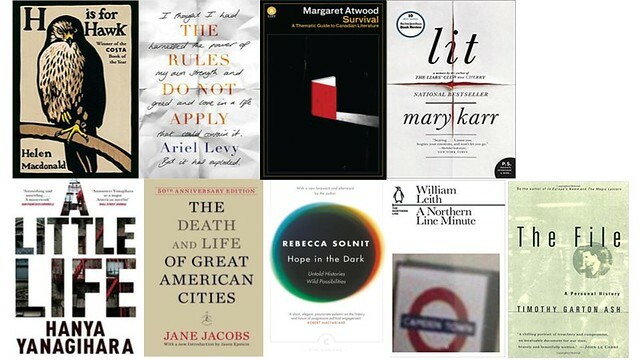 H is for Hawk was my absolute favourite, a gorgeous book; Margaret Atwood's Survival and Jane Jacobs were the books from which I learned the most; A Little Life was the best page-turner.